And that’s on a good day. To call it a failed experiment would be an understatement.An expensive solar road project in Idaho can’t even power a microwave most days, according to the project’s energy data. 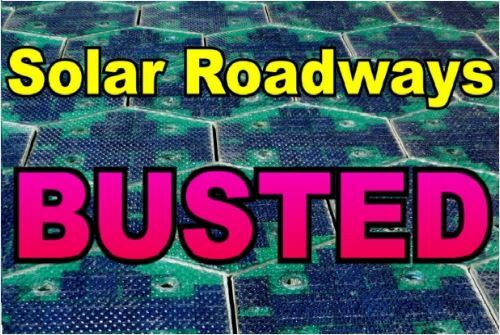 The Solar FREAKIN’ Roadways project generated an average of 0.62 kilowatt hours (kWh) of electricity per day since it began publicly posting power data in late March, reports The Daily Caller. To put that in perspective, the average microwave or blow drier consumes about 1 kWh per day. On March 29th, the solar road panels generated 0.26 kWh, or less electricity than a single plasma television consumes. On March 31st, the panels generated 1.06 kWh, enough to barely power a single microwave. That’s OK, it wasn’t their money or something. This entry was posted in Climate, comedy, energy and tagged comedy, energy, media, science and technology, tallbloke. Bookmark the permalink.